The Jewish Federation of Sarasota-Manatee is a federally-registered 501(c)(3) public charity organization. A copy of the official registration and financial information may be obtained from the Division of Consumer Services​ by calling toll-free 1-800-HELP-FLA or online at FloridaConsumerHelp.com. Registration does not imply endorsement, approval, or recommendation by the state. 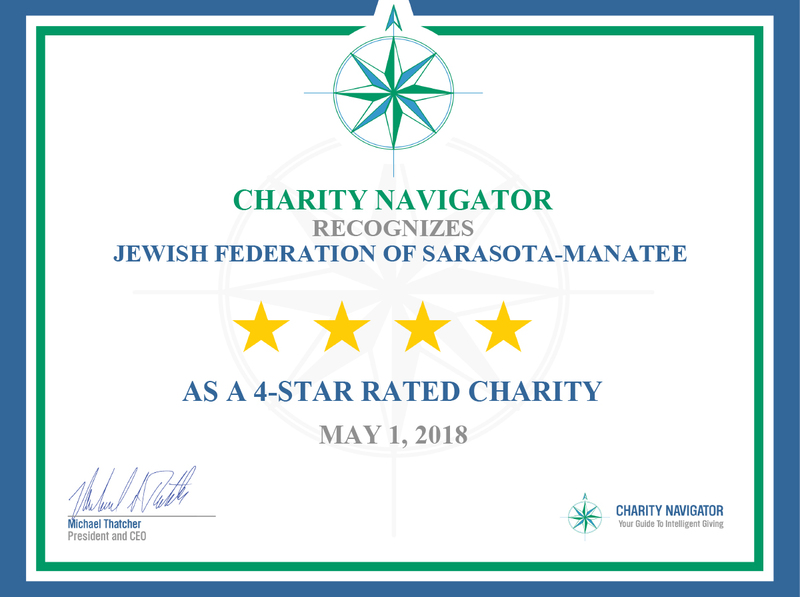 The Jewish Federation of Sarasota-Manatee is rated 4 out of 4 stars by charity watchdog organization Charity Navigator. To view our rating, please go to CharityNavigator.org. To view our 4-star certificate, please click HERE. If you are having issues with this website, please contact the WEBMASTER. Copyright © 2019 The Jewish Federation of Sarasota-Manatee . All Rights Reserved.